Come kick off our 10th Anniversary! 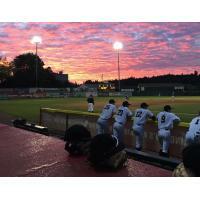 2019 Preview Night: Join us as we welcome the newest West Coast League team and our rivals, the Ridgefield Raptors, for a fun exhibition game filled with competitive surprises! Opening Night 2019: Don't miss the festive launch of our exciting tenth season and a post-game fireworks spectacular! Join us throughout the summer for exciting events, like the successful "Shirt Off Our Back" auction, the Kids Dash 4 Cash and Money Dig events, Chuck-a-Ball for Charity, new between-inning entertainment, and much more! Plus, Bob Crisman's Gallery of Diamonds presents an all-new Ladies Diamond Dig which will include 10 diamond rings to celebrate our 10th Anniversary! Cort Carpenter returns July 19! Kelso's own record-setting athlete and Nashville star Cort Carpenter is back for an amazing night of baseball and great music on July 19! Your game ticket includes this special post game concert. Last spring, Cort released the single "Holy Ground" and the video features footage shot throughout Kelso and Longview. Don't miss one of the biggest nights of the year! 1. Call or stop by the Black Bears ticket office to purchase season tickets (not available online). Invite the people you care about to the ballpark. You'll save money and have more fun at every game this season! *Season ticket renewals must be paid for in full before referring others. Referral sales available December 3 and may not include other season ticket holders from 2018. Applies to Grandstand season tickets only.